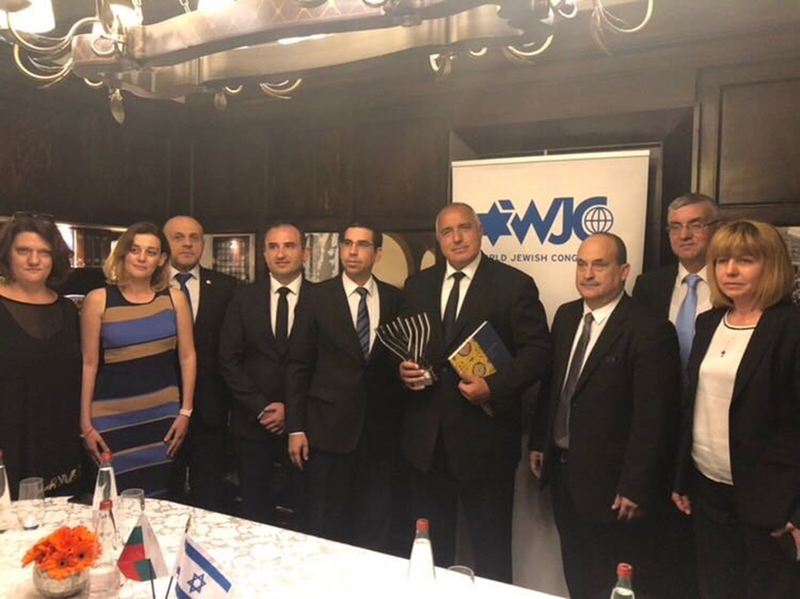 Bulgarian Prime Minister Boiko Borissov has held a meeting with 3000 members of the Bulgarian Jewish community in Israel, emphasising the excellent co-operation with the Jewish community in Bulgaria, represented by umbrella organisation “Shalom”. Tel Aviv mayor Ron Huldai expressed the gratitude of the Jewish people towards Bulgaria for the rescue of about 50 000 Bulgarian Jews from being murdered in the Holocaust. “Today we celebrate three important celebrations – 75 years since the rescue of the Bulgarian Jews, 70 years since the creation of the state of Israel and of course the birthday of the Prime Minister of Bulgaria Boiko Borissov,” Huldai said at the June 13 event. Huldai said that the truth was that during the Holocaust, Bulgarians had shown themselves to be truly righteous people. Only in Bulgaria had everyone united and “literally with their bodies” stopped the deportation, he said. Borissov said that events such as the Holocaust should never be allowed again. Of bilateral relations between Bulgaria and Israel said, “let us keep the two nations together and help each other”. Huldai and his counterpart, Sofia mayor Yordanka Fandukova, confirmed that in September, they will be together for the unveiling in Tel Aviv of a twin of the Monument of Thanksgiving in Sofia, which commemorates the rescue of the Bulgarian Jews. Borissov was earlier accompanied to a meeting with representatives of the World Jewish Congress in Israel by leaders of the Organization of the Jews in Bulgaria “Shalom”, President Dr Alexander Oscar and CEO Julia Dandolova, and the President of the Central Israelite Religious Council of Bulgaria, Sofia Cohen. Prime Minister Borissov at the meeting with the WJC representatives in Israel. Borissov is holding a copy of the book ‘Bulgarian Jews: Living History’ published in 2018 by the Organization of the Jews in Bulgaria ‘Shalom’. The director-general of the World Jewish Congress in Israel, Dr Laurence Weinbaum, said that the WJC was proud of its partnership with Shalom and thanked Borissov for his support for the Jewish community Bulgaria. In a June 12 letter to Borissov, WJC president Ronald S Lauder said: “Your strong support for Israel sets a shining example for other countries to emulate”. 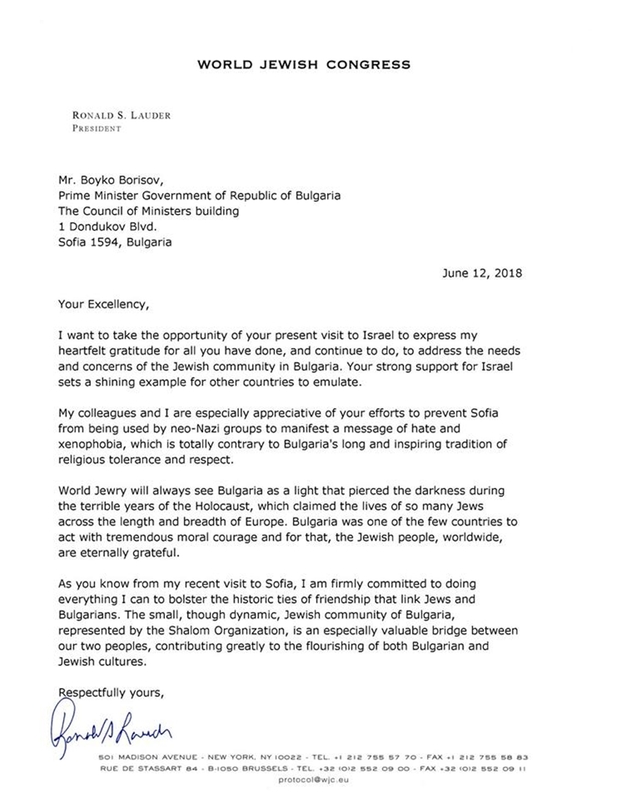 “My colleagues and I are especially appreciative of your efforts to prevent Sofia from being used by neo-Nazi groups to manifest a message of hate and xenophobia, which is totally contradictory to Bulgaria’s long and inspiring tradition of religious tolerance and respect,” Lauder told Borissov. Lauder said that he was firmly committed to doing everything he could to bolster the historic ties of friendship that link Jews and Bulgarians.